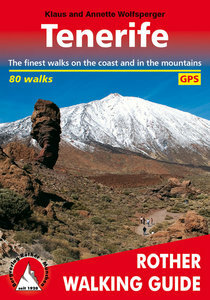 Tenerife can easily be described as the most versatile hiking paradise of the Canary Islands. The »Island of Bliss« not only offers the highest peak of the Canary archipelago and the whole of Spain – the Pico del Teide measuring 3718m – it also unites countless, completely different types of landscape: the extremely bare, almost desert-like south, holiday destination of sun aficionados, is in strict contrast to the picture landscape of the fertile north with its sumptuous nature. The mountain regions are covered in evergreen laurel and heathered forests as well as extensive woods of pine tree. A scenic highlight is bound to be the moon landscape of the Cañadas del Teide National Park. As a result, Tenerife is not only a refuge for central Europeans who shy away from winter, but mainly an ideal island for hiking. With the wide ocean at all times in sight, the range of the 70 hiking tours presented in this guide includes easy paths over rough cliffs and picturesque trips to heights as well as ascents to peaks that offer a fabulous view – hiking paths through fairytale-like nebulous primeval forests are also included, such as the partially paved Caminos, which in the early days where the main connecting routes between villages. Many tour suggestions in this hiking guide are suitable for less experienced hikers. Skilled mountaineers who do not fear »tours of the drastic kind« and who are in for a touch of adventure and a bit of a kick will also find a rich offering: daring cliff tours, spectacular ravine excursions and extensive mountain trips whose highlight must be the parade summit of the National Park.